Cross contamination can occur when a container is not properly washed out and sanitized after carrying a potentially contaminated load or when food is not transported at appropriate temperatures. Today’s consumers must be confident about the safety of the food they buy, and the growers and producers must be able to pass along that confidence to their customers. The FDA is catching up with the need for guidelines and standards that eliminate cross-contamination. KleenTrans is a pioneer in recognizing this need and in creating applicable systems. We have always felt that it is inevitable that services like ours will be become standard procedure in the future of food safety. 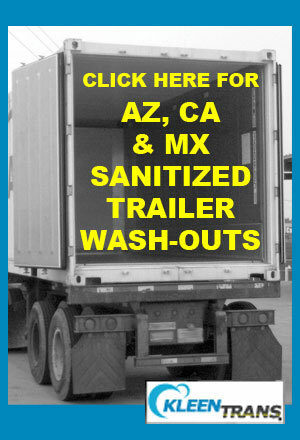 As of April 2017, the FDA's Food Safety Modernization Act (FSMA) dictates that minimum food transportation sanitation requirements are met and properly documented. The services and the documentation we provide truck drivers will satisfy these FSMA requirements. /// A thorough cleaning and sanitation program, including ATP testing and certification seals. 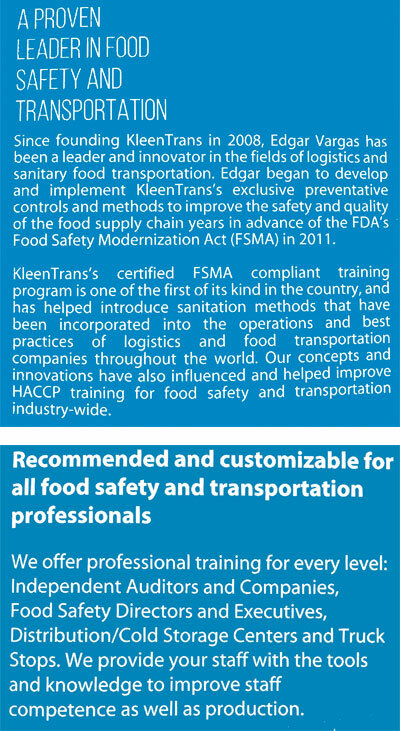 /// Includes training and certification of employees for FSMA compliance. /// Documentation and reports of initial inspections, cleaning and sanitation processes and ATP swabbing. /// Copies of certificates of cleaning and sanitation are kept on site. /// An additional revenue stream. The demand for food safety is growing. Provide food safety assurance of your wash-outs and profit. /// Be a preferred vendor. /// Be a leader and be one of the first to offer this assurance to your customers. /// We currently provide services in Arizona and California.